Product Details-Soft plush cover in a platinum grey with paws print design.Posts wrapped in natural sisal.Padded sleeping pad, and a Tunnel lined with felt.Cave offers a place to rest, play or hide.Rope and ball toy.Comfortable cubicle with a removable cover that can be cleaned by hand washing. Product Information-The Trixie San Fernando Scratching Post Beige is a space-saving post for kittens and small to medium sized cats. 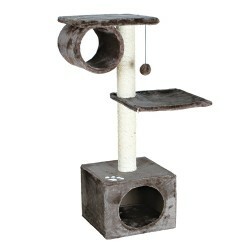 The scratching post offers your cat a chance to climbing and fill their natural desire to scratch. Once they are done clawing there is a cave and tunnel that are great for relaxing and lazing about.Soft plush cover in a platinum grey with paws print design.